Butz Welding & Fabricating Ltd.
Butz Welding & Fabricating Ltd. has provided custom steel, aluminum, and stainless steel fabricating services since 1947! Our shop welcomes all kinds of custom jobs, with the ability to offer welding, machining, punching, milling, drilling, cutting and sawing, shearing, rolling and assembling. We are also capable of selling sheets of steel, or even shearing and sawing steel, aluminum, and stainless steel to size for your own projects! Let us provide you with custom products that meet and exceed your highest expectations! If you’ve got a metal fabricating project or need metalworking for a specific product, Butz Welding & Fabricating Ltd. wants to work with you. Our machine shop in Toledo, OH is ready to tackle just about any job with a diverse range of machinery and a proven staff of metalworking professionals. We guarantee results that not only meet the specifications of your project but also exceed your highest expectations. We promise nothing less than impeccable results, whether we’re welding and repairing a product or forming, machining and assembling a prototype. Our full scope of capabilities includes punching, milling, cutting and sawing, shearing, rolling and more! We pay close attention to every detail to make sure the results are flawless. 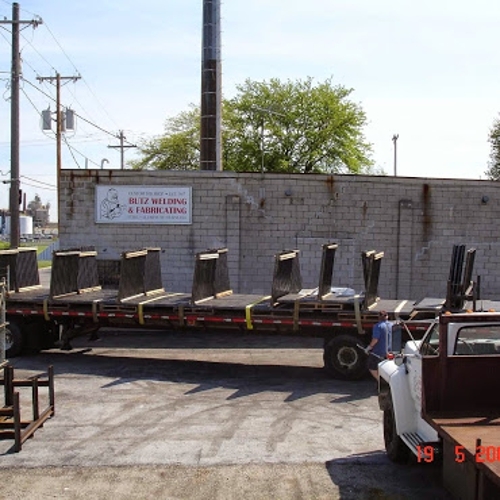 Our welding shop in Toledo, OH is equipped to work with steel, aluminum, and stainless steel materials, producing a variety of products that meet the practical and functional needs of our customers. Bring us a comprehensive mockup and prototype design or even a basic sketch with a few parameters and we promise to turn out results that are a tangible representation of your concept. We can assist with one-off fabrications, production work, prototyping and more, bringing you online to having the right product for your unique application. Reach us today with your specifications and let us get to work! We’re a 3rd generation family-owned and -operated shop! We opened our doors in 1947 and have been hard at work ever since then, bringing our customers top-level service. Our custom fabrication capabilities enable us to work from print and sketch, ensuring you get the products you need. We’re a standing member of the American Welding Society (AWS) and the Fabricators and Manufacturers Association (FMA). We work expertly with steel, aluminum, and stainless steel, offering welding, machining and a variety of other fabricating services. Our scope of experience and abilities includes fabricating items such as handrails, railing, mezzanines, catwalks, stairways, conveyors, racks, stands and so much more. We have a selection of metal for purchase! We can shear or saw metal to size, even if you just need metal for your own use! Send or bring us your specs or even a quick sketch and we’ll get to work bringing your creation to life in our shop! From welding to machining and beyond, we do it all.